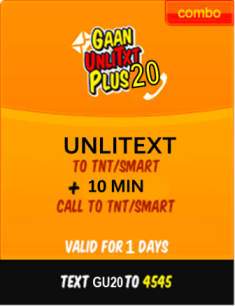 Looking for the complete list of TNT GAAN Unlitxt plus promo? Here it is. 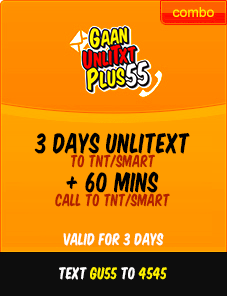 Talk N Text offers you GAAN Unlitxt Plus. Unlimited Texts to all TNT and Smart subscribers plus minutes of calls. An affordable offer by Talk N Text to its loyal subscribers. Want to subscribe to this promo? 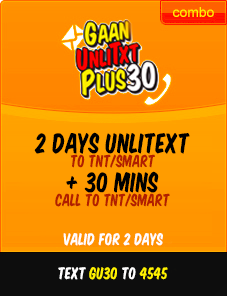 This unlimited texts and 20 minutes of call to all TnT and Smart subscribers for only P30 is valid for 2-days. Get Unlimited texts and 30 minutes of call to all your Smart & TNT friends for 3-days for only P55. Send Unlimited text and make 40-minutes of calls to you Smart & TNT friends for only P99.00! This promo is valid for 7-days/1-week! How to use the GAAN Unlitxt Call? Please wait for the confirmation message before sending texts and making calls. Once your registration is success, you can now enjoy your unlimited texts to all TNT/SMART. Sending texts to other networks will be charged to your regular load. *This promo is only valid and available to all TNT Subscribers nationwide.